PRODUCT: NEW WEBSITES x POP ART HOODIE x BASICS CO. The group of young rarewear designers that we are seeing right now rise through the ranks of popularity and awareness is endearing. It's also amazing to watch each audience grow. Basics Co. is a front runner in the rapid growth of rarewear. Designer Bakari aka B.Haze has a name that rings a few sleigh bells throughout Seattle and although I would not call him a scenester I would say he is connector on the scene. It is proof again that you can be effective without living in the limelight and making necessary appearances. B. Haze is also a member of FTB (For The Bros) a crew of artists, designers, partiers and long time friends that are making a lot of noise in Seattle and the right parts of Tacoma. So the parallel popularity makes plently of sense but B. Haze also has a plan and a focus often using himself and female personalities in his lookbooks. What that breeds is some type of familiarity with his consumer base and sales follow - I should know since I made to rookie mistake of sleeping on the young and popping Basics Co. and the Bozy Bollection 1/4 zip fleece sold out on me. It was nice to know that I HAVE to be faster next time the demand is there. "The Pop Art design for Basics is relatively simple as you can see. This specific piece as soon as it was created i knew what was needed to make this go the way i wanted was a fire visual. " Basics has a couple of new things on the horizon that we learned about recently. The first being a revamped website that is as colorful as the personality behind the brand. It feels like sherbet land while you shop + it properly houses the archive of lookbooks designs of Basics Co. past. 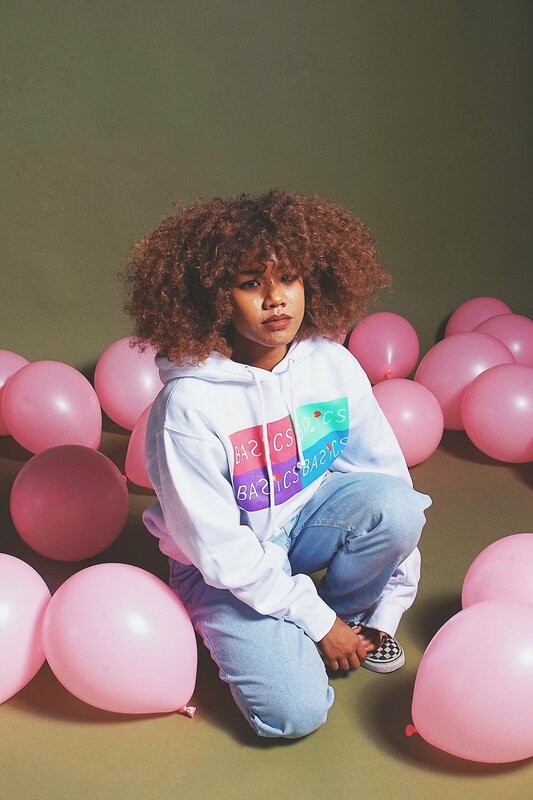 The second new is product, the Pop Art hoodie soon to release is an all white pullover with colors that seem to commemorate the revamp of the website as well with four brightly colored squares each featuring the Basics Co. location logo in white print. Or maybe that design isn't filled and that white is actually hoodie not plastisol?? Hit the new website when the new heat drops to cop up and find out for yourself. Move fast when you hear the gun blast.